After living in South Florida for 14 years, I became accustomed to great places on the water and was eager to find places on Long Island that could deliver that same experience. 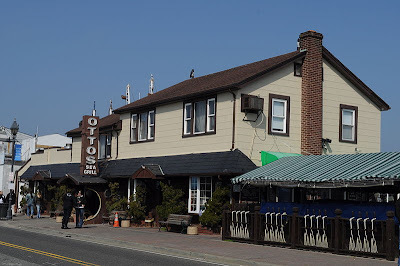 Freeport's Nautical Mile and Otto's Sea Grill were recommended to me by friends and co-workers. After how many bad experiences I've had there and pretty much being told this was the best Long Island had to offer, I was about to move back to Florida! Otto's Sea Grill is good for only two things. The water setting and the occasional live music. Not the service, not the drinks, and definitely not the food. If you are going to be sitting inside, I would just pass on this place because there is no point. Sitting outside is always nice because of the water, but be prepared to sit at cheap picnic tables and old benches with sticky table cloths. No matter what day of the week or time you come here, the service is always irritatingly slow. Although Otto's appears to have a great menu, the food is average to below average. You can easily tell that much of their food is pre-frozen due to the lack of quality. Chicken fingers and mozzarella sticks are definitely frozen! Calamari is chewy and tough, the New England Clam Chowder is just ok. I've also ordered entrees such as salmon and shrimp scampi and was less than pleased. A lot of the food is bland and desperate for seasoning and unfortunately for a place right on the water, most of it does not seem that fresh. The entire menu is totally overpriced for the quality and especially for the portions. When it comes to drinks, everything tastes watered down and is of course overpriced. The whole Otto's experience is such a shame and I honestly wonder how the place stays in business. Despite how terrible this place is every time we go, we somehow found ourselves there again and again each summer. This summer, we have decided to skip the Nautical Mile altogether. If you're looking for a great place to hang out and get some great drinks, I highly suggest driving the extra 10-15 minutes to the Long Beach area or even Island Park to check out Pop's Seafood Shack & Grill.